Every year when the kids’ birthdays roll around, my wife Carol tries something different to celebrate. As a creative director, she is, well, pretty creative, so I’m always expecting something new & exciting. This year she decided to try her hand at making cake pops. 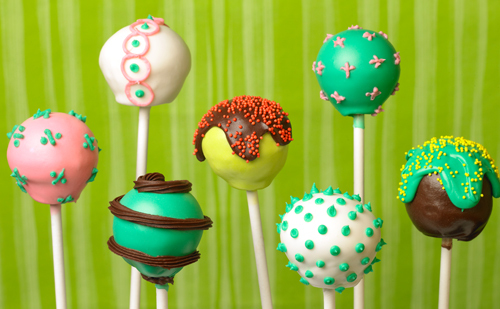 Cake pops have been “all the rage” ever since Angie Dudley of Bakerella fame published her recent book. Although Angie forms her pops from crumbled cake, Carol decided to try baking them from a set of Bake Pop trays. Carol also wanted her pops to have a soft exterior coating of frosting, rather than the harder candy melt surface that Angie suggests. Either way, cake pops are all about the decorating, and, as you can see from our photo above, anything goes! Bake cake mix in bake pop trays. Allow to cool. Remove pops from tray. Place candy melts in narrow microwave-safe bowl and melt in microwave, per candy melt package directions. Dip lollipop stick approximately 1/2″ into melted candy. Next, insert stick halfway into cake pop. Place pop on small baking sheet or plate. Repeat with remaining pops. Place pops in freezer for 15 minutes to secure lollipop stick. Dip cake pops fully into melted frosting and allow excess to drip away. Insert stick end of cake pops into styrofoam board to dry. Once the pops have dried, decorate as desired. For more cake pop tips & methods check out Bakerella’s “how to” video. OMG, they are so cute 🙂 Gotta try these cuties soon. I created one for Father’s day too. Check out my blog and let me know what you think. I received a cake ball/donut hole baker for Christmas and was just wondering if melted frosting would work! I’ve used that technique on cupcakes and love how quick & easy it is. Do you think it would work for cake balls (not pops on a stick) or do you think the frosting would just drip off? Thanks! Yes Jen, it will give you the same frosted effect, but you will be left with cooling rack lines, or a flat side on the bottom. They were yummy. A fun way to have just a small piece of cake. Nice…. I am going to try them!